To make maple syrup, collect sap from sugar maple trees (Acer saccharum) and cook it down. This is done by placing small tubes (also known as “taps” or “spiles”) into shallow holes in the tree’s trunk; they direct the sap into buckets or other receptacles. After collecting it, pour the sap into a large pot and cook off the water, thus concentrating the sugars. The result is sweet, delicious maple syrup. What is Maple Syrup Made Of? Maple syrup is concentrated maple sap. It’s collected in the early springtime by drilling small holes in the living tree to the depth of the xylem. That’s the part of the inner bark that is very much alive and carries nutrients (dissolved in water) from the soil and roots up to the branches, where leaves will grow. Sugar is the main nutrient that both we humans and the tree’s leaves are interested in; it makes syrup sweet and fuels new growth. In addition to sugar, minerals travel up the xylem. These are what give maple syrup its particular “mapley” flavor. Mature sugar maple tree (or other sweet sap–bearing tree, see below for alternate species): The trunk should be at least 12” in diameter. Larger trees can support more than one tap. Cordless drill. Unless the tree is very close to a power source. Spile (a.k.a. tap). These can be purchased and are usually made of plastic or metal (we recommend metal over plastic, see resources below), or you can make your own out of bamboo tops or sumac or elderberry stalks. If you make your own spiles out of natural materials, be sure to carve them as close to round as possible to prevent leaks. Hammer. Any kind of hammer will do…you could even use a heavy stone in a pinch. Bucket. A lightweight container with a handle is ideal. Large pot or trough. To cook down the sap into maple syrup. Select your tree(s), and observe the weather. Maple sap flows when nighttime temperatures are below freezing, and it warms up to above freezing during the day. 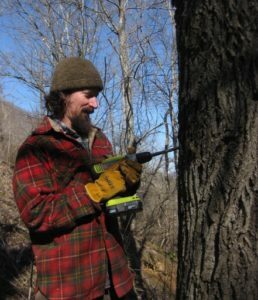 Drill hole(s) into the maple trees you’ll use to make maple syrup. Choose a drill bit that is very slightly smaller than your spile diameter – and very sharp! Drill into the tree 1.5″ to 2″ deep (about 1″ past the rough bark). It’s best to make your holes directly below a large branch and/or above a large root. Insert the spile (tap) by gently tapping it in with your hammer. Hang the bucket on the hook that is part of the spile, or on a separate hook if your spile doesn’t have one. Note: The tree in these photos is a black walnut, not a sugar maple. The spile pictured is made of bamboo. 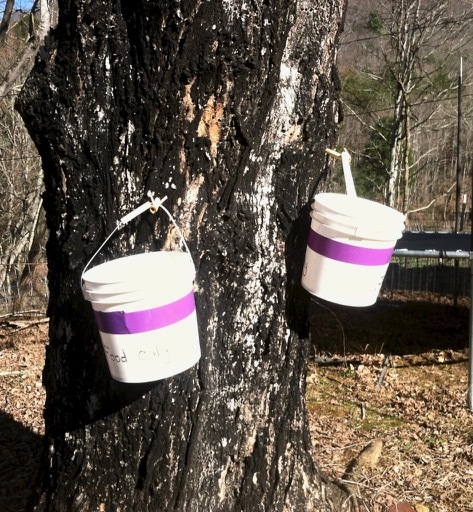 Gather sap once or twice daily, depending on the size of your bucket and the speed of the sap flow. It’s ideal to collect sap in the evening, as it may freeze solid overnight if left out. 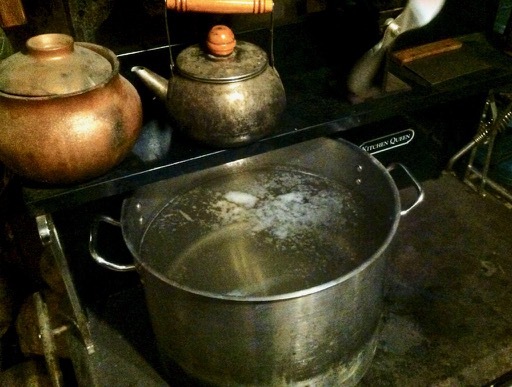 Cook sap in a large, wide pot or trough to remove water and concentrate sugars. This will take several days and cause a lot of steam. Stir the syrup toward the end as it gets thicker, and lower the heat to prevent burning. Traditionally “sugaring houses” were used for this purpose, so as not to steam up the kitchen and monopolize the stove inside the home. Cool and bottle your syrup. It’s is ready when it tastes very sweet and heavily coats the back of a spoon. If your syrup isn’t cooked down enough, it may mold, whereas if it’s cooked down too much, sugar crystals will form as it cools. Early spring is the time to make maple syrup. Sap flows when nighttime temperatures are below freezing and daytime temperatures go above freezing. In fact, ideal daytime temperatures for sugar maple sap flow are in the 40s. Other trees, such as sycamores, will still flow well in higher temperatures (up to the 60s). Watch the weather forecast carefully. Maple syrup will have off flavors if it’s made from trees that are budding out. Watch the trees, and stop tapping for syrup when buds swell. Are there other kinds of trees that will also make syrup? There are several other kinds of trees, along with the sugar maple, that can be tapped like this to collect sap for syrup. Other species of maple – such as red, silver, black and Norway – will also yield sweet sap. 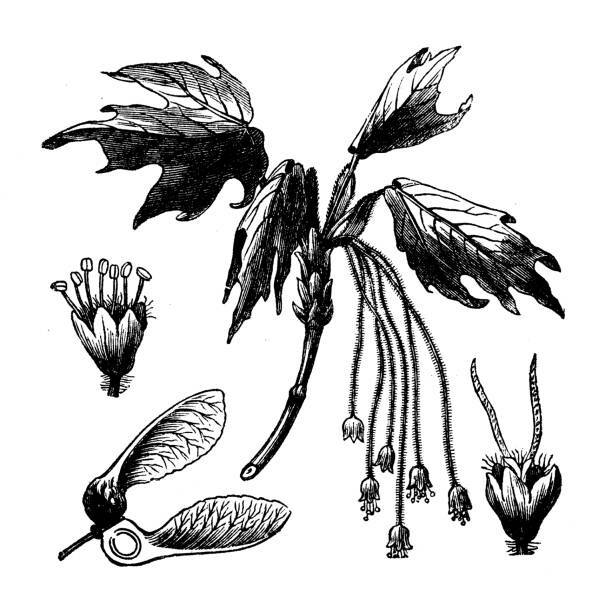 Some examples of other syrup-producing trees are hickory, birch, box elder, sycamore, butternut and walnut. These other species all have a lower percentage of sugar in their sap. Boiling times will be longer and yields smaller than with sugar maples. That’s why sugar maples are used to make maple syrup commercially. Is it worth making maple syrup from just one tree? Even if you just have one good-sized sugar maple tree, it’s totally worth making maple syrup. The average expected yield of sap per spile is 10 to 20 gallons. At about 2% sugar, that means it’s reasonable to get more than a quart of maple syrup per tap. A large tree can easily handle 2 to 4 taps. So, tapping just one large sugar maple could provide a whole gallon of maple syrup! 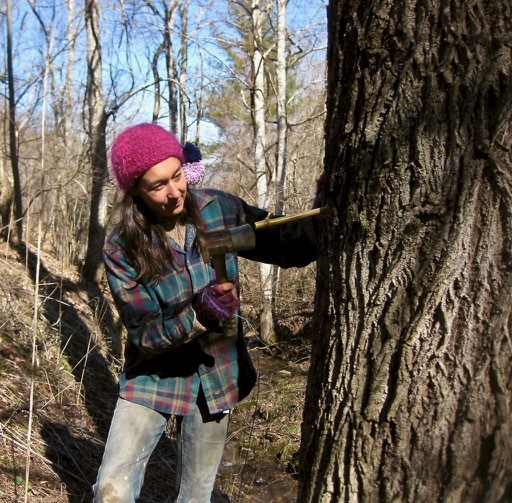 Making maple syrup is a great way to tap into the power and life-force of trees (pun intended). It’s also a good excuse to visit the forest each day during the cold time of year, when we are usually cooped-up inside. Children, who tend to love sweets, are usually excited to get involved in the annual ritual of making maple syrup. There’s not much sweeter than making (and sharing and enjoying) your own homemade maple syrup. If you want to find these items locally, more power to you! If you want to buy them online, we participate in an associate program with Amazon.com, and when you click on the links below, we benefit. Any money that we make from this program goes into a fund that helps us continue to offer free information and resources to everyone.